Welcome to the Utrecht DESIGN KITCHEN ! The purpose of this e-learning is to explain the scope of the Design Kitchen and the Code it follows. With the Design Kitchen Manual, we want to ensure a controlled way of working in order to work safely, hygienically and according to high quality standards. The Design Kitchen is a place to prototype, co-create with our main stakeholders & Chefs and get early consumer feedback on the innovation concepts and product experience. The Design Kitchen will allow AMN & ELN businesses to ensure the Product Superiority, and to accelerate & strengthen their innovation process in scoping more accurately all new projects thanks to a design thinking approach. The Design Kitchen follows the Hygiene code for Care institutions (e.g. hospitals) and Defence. The Hygiene code for the food provision in care institutions and Defense is an elaboration of the HACCP principles of the EU Hygiene Regulation (EC) no. 852/2004 and Regulation (EC) no. 853/2004. The Design Kitchen procedures should be read, understood & applied by all Danone employees who will prepare/cook products in the Design Kitchen. Prototypes that will be prepared/cooked in the Design Kitchen will need to stay in the Design Kitchen. No possibilities to send prototypes outside of Nutricia Utrecht building. The above table explain top line responsibilities of the Design Kitchen activities. All Employees are expected to follow this RACI. Are these activities allowed in the Design Kitchen? How to book the Design Kitchen? 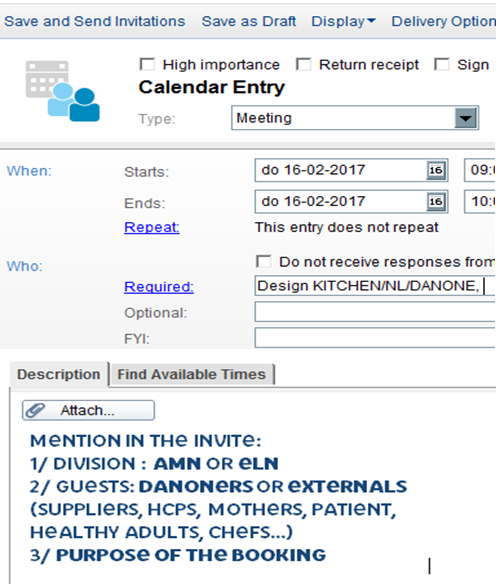 You can book the Design Kitchen in sending a meeting invite to [email protected] until the new booking system in Axxerion that will be shared with SBS is available. For each risk level, a first estimation of the mitigation actions is given. You would like to give to healthy elderlies a commercial product from supermarket shelves. What would be the risk level? You would like to give to children (6years old) a product targeting Alzheimer patients. What would be the risk level? You would like to add a flavour on top of an existing Nutricia product that is released by Pilot Plant. What would be the risk level? - short hair or keep long hair tied back. - no beard or a short, well-groomed beard or moustache. - do not wear jewellery or watch on wrist or hands. - short and clean nails, no artificial nails allowed. - wash hands and wrists thoroughly. - minimise contact with food with bare hands. - do not wipe your hands on your clothing as this can easily transfer microbes and bacteria. - non-infected wounds should be covered with a water-repelling coloured plaster. - Wash not only the hands but also the wrists. - With running water and odourless soap for at least 10 seconds. - Rubbing hands over hands. 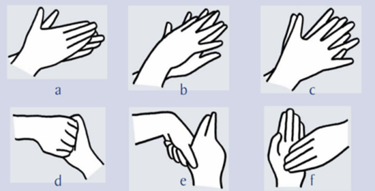 Also between fingers and under the nails (see figure). - Dry your hands with disposable paper. What are you allowed to store in the Design Kitchen? Many answers are possible for this question. Could you select the fridge & freezer that should only be used for storing raw materials? What should appear on the label of raw materials or finished products you would like to store in the Design Kitchen? What are the steps of your prototype preparation? Each time you will prepare/cook products in the Design Kitchen with the objective to taste them with internals or externals, you need to fill in your Test protocol & HACCP Registration form - WD.03.02. Test protocol & HACCP Registration form should be sent to [email protected] afterwards for traceability reason. DK Owner will make sure reports are kept for 12 months. Who is responsible of the preparation activities before organising a test with externals? Who is responsible of the different activities during a test with externals? Who is responsible of the different activities after a test with externals? Paper/cardboard: packages, boxes, tissues, empty tissue boxes. Liquid/ semi solid product waste: Liquid products, crèmes and also product left over’s in cups. Glass: glass bottles for instance. Rest: All the rest of waste. The Design Kitchen is cleaned every workday by a cleaner. The cleaner will clean the floor, working areas and front of the cupboard. The work surfaces and equipment should be cleaned by the users after each use. Chemicals and toxic materials to be used in the Design Kitchen have to be requested to suppliers with their Master Safety Data Sheet (MSDS)Specification by either or . Logistics & Taner Yakis will make sure to register all chemicals and toxic materials following HSE procedures, check their labels or re-label them if necessary (with their GHS hazard pictograms) and keep their MSDS till the chemicals will be discarded. Before a Danoner can use a dangerous good in finished products for tasting, DFSCQFSYour boss should be involved to check the maximum dosage that is allowed for toxicity reason. pour chemicals in the sinks of the Design Kitchen.